"I have never been short of copy for an issue or missed a deadline in 28 years as Editor"
Professor Steve Saxby is Director of the Institute for Law and the Web, and Professor of Information Technology Law and Public Policy at the School of Law, Southampton University. He is also founding Editor and Editor-in-Chief of Computer Law and Security Review - The International Journal of Technology Law and Practice (CLSR). 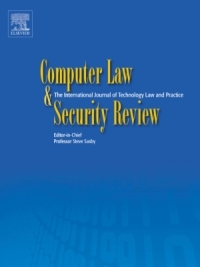 Published six times a year and now into its 28th volume, the international journal focuses on technology law and practice, providing a major platform for publication of high quality research, policy and legal analysis within the field of IT law and computer security. The journal receives circa 200 papers per annum, of which around 30% are eventually published. Steve Saxby’s current research interests lie in the public policy issues in public sector information; both its use and exploitation as well as new forms of information such as geospatial data. In 2011, he updated his research with a paper examining the politics and process of policy development in public sector information over the past three years. He is presently a member of a research team involving seven universities/research groups taking part in a £1.85m Engineering and Physical Sciences Research Council (EPSRC) funded project examining ways to improve understanding and authentication of identity in the digital environment. Q. What does being a journal Editor mean to you and what do you find most rewarding about this role? A. It’s immensely rewarding. It’s my window on the world; it keeps me on my toes and up to date with what’s going on. You accomplish more in the working day if you are an Editor as you have to keep up. So long as you have the drive to do that it is a great position to hold. I also love to give folk the opportunity to break through if they have a good paper on a new topic. Finding these gems and getting them out there is a real buzz. As Editor, I can maintain contact with the profession and academic community all over the world. It is better than Facebook for keeping in touch! Q. What are your biggest challenges as Editor of Computer Law and Security Review? A. You cannot let your standards drop and for that reason you have to put in the time to get reviews done, improve papers, work with authors and make sure that you keep track of what’s new. You have to love what you are doing. As CLSR was founded back in 1985, it was around during the period when critical legal thinking was taking place to upgrade the law from the offline to the online world. So, from its early beginnings when there was - quite frankly - not much ‘computer law’ about, it now embraces a field in which the scope of legal development and change is immense and fast moving. My biggest challenge then is to keep up with what’s going on and there’s no easy way to do that. Q. How do you overcome these challenges and what extra support can Elsevier provide? A. My eyes and ears are my colleagues serving on the Editorial and Professional Boards and my colleagues here at the University; I value their opinions very much. I found the Elsevier Editors’ Conference in Budapest in May 2011 a real eye opener. It was great to engage with other Editors and to see all that Elsevier is doing. Being an Editor for a long time certainly helps too, as does being a specialist in the overall field - after a while you get an instinct for a topic and an idea gels. It also helps to know where the major research centres are in the field. With regard to competitor challenges, one must always be prepared. Hard work and being open to a regular review of your methods is important. Getting out into the field is vital too and CLSR does this through its sponsorship of www.lspi.net. I think it is also important to bring new people on to the Boards of CLSR from time to time. That does mean saying goodbye to existing Board members, but it is important that the journal keeps refreshing its advisory team so that the impetus for new ideas and advice remains. Q. In many areas of research, the growth of paper submissions is outpacing the growth of qualified reviewers and resulting in pressure on the peer-review system. What do you think the solution to this problem is and how do you see the peer-review process changing in the future? A. I don’t have easy answers. You just need to keep your network going and bring in new people when you can. You have your tried and trusted reviewers and folk who in the past have published papers and have the expertise to advise. You have to value these reviewers and try to keep them on board. It is also vital to keep talking to the wider community of authors and researchers, for example at conferences and workshops. The rewards for reviewing are usually intangible - most folk do it because they want to stay on the cutting edge. If you are interested, researching or practising professionally in a field, then you are naturally interested in a good paper. No half measures, hard work and commitment is all I can suggest but I do believe the peer-review process is vital to maintaining quality. Q. We have observed a recent trend that researchers are increasingly accessing journal content online at an article level, i.e. the researcher digests content more frequently on an article basis rather than on a journal basis. How do you think this affects the visibility of your journal among authors? A. The key thing for me is that the papers are published in CLSR. If they don’t carry that seal of approval then the reader is not aware of the provenance of the paper. It has to be linked to the journal and to an issue. Of course, folk will download but they will do so because they know from whence the paper comes. It is the hallmark of peer reviewed quality if it comes with the CLSR imprint on it. That link must not be lost. 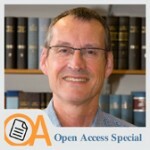 What is your opinion about the open access movement and how does it affect your journal? A. Open access after publication and in the author’s imprint on peer to peer sites like SSRN is fine with me. There are plenty of folk out there who will also want the added value of SciVerse ScienceDirect and the tools available for finding papers. I have no problem with that at all. I would never go down the path of making CLSR an Author Pays journal – to me that would undermine the independence of the journal’s content and its position as an academic journal of repute. Q. Researchers need to demonstrate their research impact, and they are increasingly under pressure to publish articles in journals with high Impact Factors. How important is a journal’s Impact Factor to you, and do you see any developments in your community regarding other research quality measurements? A. The Impact Factor is not used in Law journals nearly as much. Lawyers tend to use primary sources when they write, rather than cite other authors. It is not a factor that will be used directly in the forthcoming academic review of legal research known as the REF – Research Excellence Framework. Q. As online publishing techniques develop, the traditional format of the online scientific article will change. At Elsevier we are experimenting with new online content features and functionality. Which improvements/changes would you as an Editor find most important? A. Lawyers want embedded web links to primary sources and whatever added value can go with that. The new online content features you mention are probably going to be more useful in the scientific, rather than the legal community. However, I am always open to suggestions. Q. Do you use social media or online professional networking in your role as an Editor or researcher? Has it helped you and, if so, how? A. I do belong to LinkedIn but do not use it yet as much as I should. I think it could be useful for informing users about content as well as finding folk out there with expertise who might like to write or review for CLSR. Pressures of work have prevented me getting stuck into professional networking and social media yet, but it is on the agenda. Q. How do you see your journal developing over the next 10 years? Do you see major shifts in the use of journals in the future? A. Since 2005, I have linked CLSR to the series of International Conferences that Professor Sylvia Kierkegaard of the CLSR Editorial Board and I run together. I think this is an excellent way to connect CLSR to its readers and the author community. 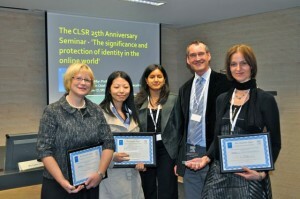 CLSR sponsors best paper awards (see photo) and I lead an annual CLSR seminar at the conference. It has been a great success, especially as it brings early career researchers from all over the world into face to face contact with me and some of my board. I will continue to build on that connection and to ensure that CLSR also uses its capability to contribute to policy debates and to government and EU consultations. This is where journals have to go in the future. Q. Do you have any tips or tricks to share with your fellow Editors about being a journal Editor? A. You have to be an early starter - getting into work early helps, e.g. 6.45am. You build experience over time and that helps in the day to day management of the journal. I juggle many tasks each day and knowing when to prioritize a task is vital and I have never been short of copy for an issue or missed a deadline in 28 years as Editor. The secret is keeping on top of everything and being flexible too. I don’t let things pile up. When a new paper comes in I try to sort out the reviewer fairly quickly and then chase things up if need be. I negotiate with my authors and use the reviews to improve papers wherever possible, even if we are not taking it. You build up a relationship that way. It is a privilege to be an Editor and the responsibility one carries is high, but I have loved every moment of my 27 years so far. I may get into the Guinness Book of Records one day for my length of service. Roll on the 200th issue in 2018!